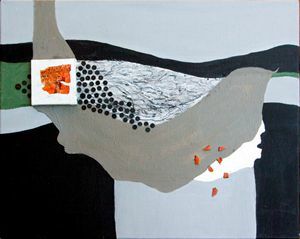 Fine Art, Acrylic, Mixed Media, Found objects on Canvas. 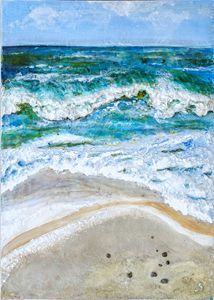 Living near the ocean, I loved the textures of the shore as the water ebbed and flowed, I wanted to capture the feeling on canvas with the three dimensionality, the sparkle of the water and the interest of the sand pebbles. For her 12th birthday Lynn received a set of oil paints, a smock and a beret from her mother. He first oil painting won first place in a show and that was the start of a life-long passion and career in art. 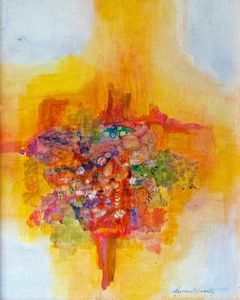 Lynn went on to earn a Masters Degree in art, to teach art in high school for a number of years and Art For Teachers at the college level. She worked in many media including painting, sculpture, pottery, jewelry, house, landscape and interior design. She designed her own home, (later sold it to an architect), which was shown on several home tours. and she received an award from her neighborhood for its landscape design. At midlife Lynn earned a Masters Degree in Marriage and Family Counseling, a Ph.D. in Counseling Psychology and taught classes in Personal Development and in Personal Relations. She also did research and writing for the Human Development Training Institute. While conducting a private practice in Relationship Counseling she pioneered workshops in Grief Recovery. Lynn was listed in the 1963/64 Issue of Who’s Who Among San Diego Women, the Power Source. 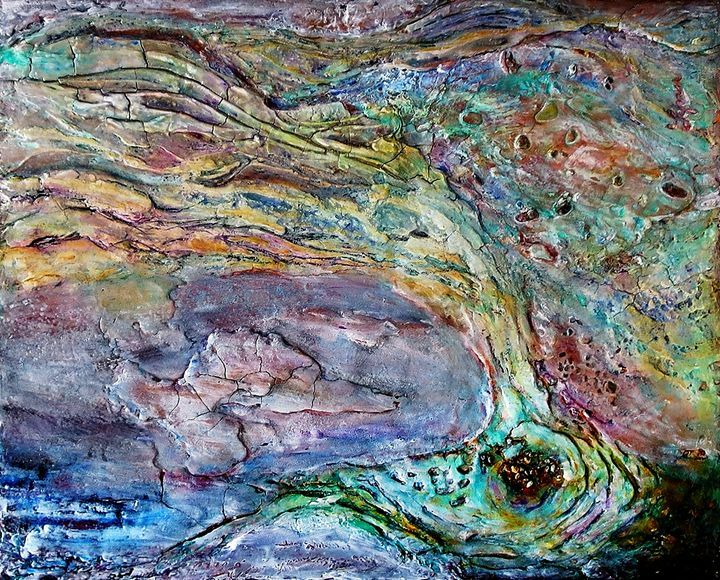 Upon retirement, Lynn returned to painting; experimenting with mixed media, and multi level paintings. 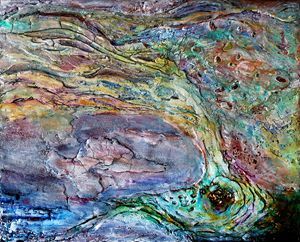 Her work is very unique, modern, abstract, textural, , inspired by nature and informed by her multi-dimensional background. 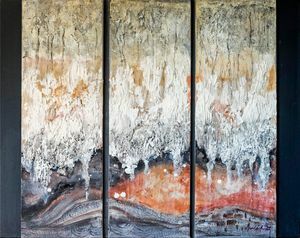 She uses materials such as melted metal from a burned down house, sand, leather, fabric, driftwood, etc. She was an Associate Artist of the Museum of the Living Artist in San Diego where she regularly exhibited and sold her jewelry and she won a Juror’s Choice Award for one of her sculptures. 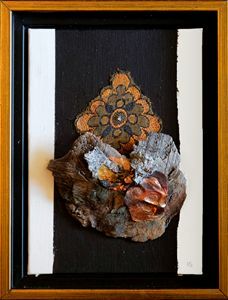 More recently she was awarded 2nd place by the Artists' Round Table for a flamed copper collage and more recently a first place award in the professional abstract division at the 2018 Sonoma County Fair. 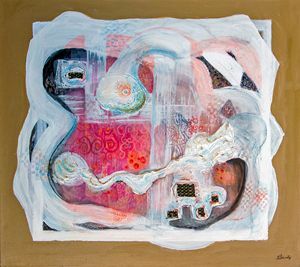 She now lives in Santa Rosa and is a member of the Artists’ Roundtable, the Oakmont Art Association,and the Sebastapol Center for the Arts. 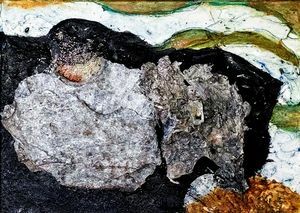 She has exhibited widely and her work is in many private artists' and collectors' collections.